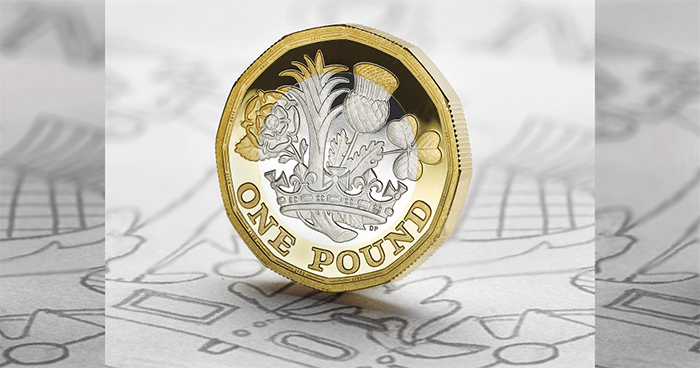 The Royal Mint have launched (8th March) their latest product, which is associated with the country’s newest coin to enter circulation—the new 12-sided £1 coin (shown above). 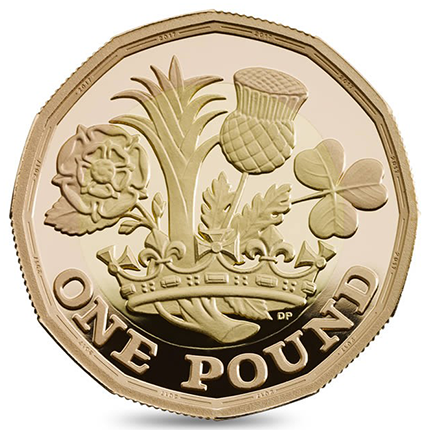 The new coin is to replace the current “round pound” coin, which has circulated since it replaced the banknote of the same value in 1983. 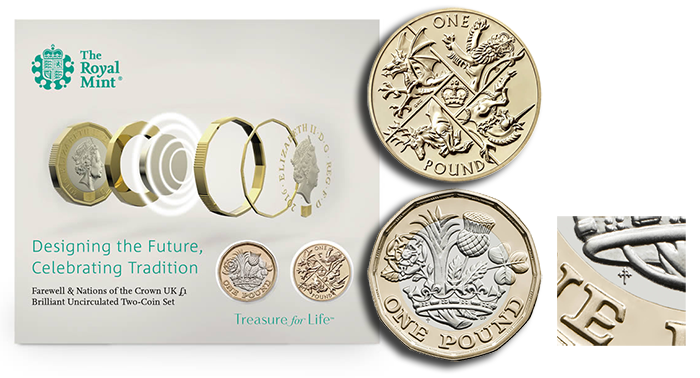 The £1 coin was used as a focal point for a variety of reverse designs highlighting the four constituent parts of the United Kingdom during its 33-year-long tenure. The new £1-coin project was devised due to a significant level of counterfeiting; it is estimated that out of more than a billion pound coins currently circulating, more than 40 million are counterfeit. The new coin, to be officially placed into circulation from the 28th March, has integrated a variety of new and enhanced security features and has been labelled “the world’s most secure coin.” It will include a latent image on the obverse and micro-lettering on both obverse and reverse. Aside from the new shape, the coin has undergone another important change from the previous coin, with the introduction of a bi-metallic composition. The center of the gold Proof coin is 22K yellow gold, while the outer ring is 22K red gold. The new coin, which is entitled “Nations of the Crown 2017,” includes a new reverse design that was the subject of a well-publicised competition in 2014. Won by then–15-year-old David Pearce, the fresh interpretation of traditional floral emblems symbolises the four parts of the United Kingdom. David’s design incorporates the Welsh leek, the Scottish thistle, the Northern Irish shamrock, and the English rose, all emerging from a royal coronet. His reverse design will be seen by millions from the 28th March this year. The obverse will include the fifth and definitive effigy of HM Queen Elizabeth II as designed by Royal Mint engraver Jody Clark, and used on all circulation and many commemorative coins since 2015. 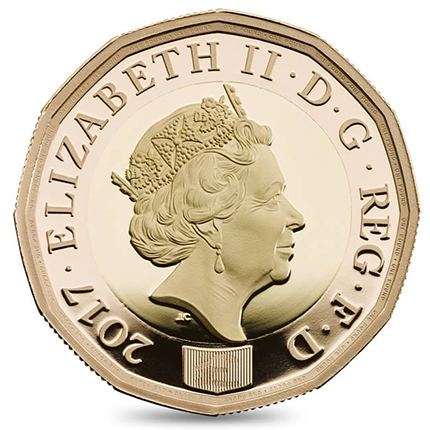 Alongside other visible security elements, the coin’s 12-sided shape (which may be familiar to collectors who recognise the old “three-penny bit”) is the result of the most up-to-date minting technology. The bi-metallic composition means it will combat the challenge of sophisticated counterfeiting. The addition of the Royal Mint’s patented High Security Feature has added to its reputation as the most secure coin in the world. The “Farewell & Nations of the Crown” set consists of two 2016-dated Brilliant Uncirculated pound coins, one round, one 12-sided. The 12-sided coin has a special “cross crosslet” mintmark (shown in close-up at the right). Good article Michael. Save me a 2-coin set, will you? Cheers! Will do, these coins are already so popular even before their official release, the day is going to be a big event for those of us who will miss the round pound and for those who are eagerly awaiting the new 12-sided coin.